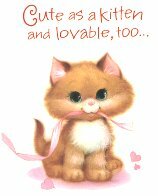 This cat valentine card is purrfect for a young person. Inside greeting - That's a perfect description of Y-O-U! Happy Valentine's Day. Envelope included.